Because PISM’s job is to approximate ice flow, its “world view” is centered around ice dynamics. The discussion of boundary conditions in this Manual is thus ice-dynamics-centric. On the other hand, there is no constraint on the nature of, or completeness of, climate models which could be coupled to PISM. This section therefore explains a PISM organizing principle, namely that climate inputs affect ice dynamics by a well-defined interface. Almost no attempt is made here to describe the physics of the climate around ice sheets, so see  for terminology and  for a review of how surface melt can be modeled. See the Climate Forcing Manual for much more information on PISM’s climate-coupling-related options and on the particular fields which are shared between the ice dynamics core and the climate model. Table 5 lists fields which are needed as boundary conditions at the interfaces. All PISM ice sheet models have some kind of interface green in Fig. 15) to a subaerial surface processes layer containing snow, firn, and liquid (or refrozen) runoff. The surface layer is assumed to cover the whole surface of the ice, and all grounded areas that the ice might occupy, including ablation areas and ice-free land. We also always have an interface (blue) to the ocean, but this interface is inactive if there is no floating ice. The surface processes layer might be very simple. It might either read the important fields from a file or otherwise transfer them from a separate (non-PISM) climate model. If, however, the surface processes layer is “owned” by the PISM model then there is an additional interface (red) to the atmosphere above. In no case does PISM “own” the atmosphere; if it has an interface to the atmosphere at all then it reads atmosphere fields from a file or otherwise transfers them from a climate model. Regarding the base of the ice, the temperature of a layer of bedrock in contact with grounded ice is generally included in PISM’s conservation of energy model; see subsections Computational box and Spatial grid. Also, as described in section Earth deformation models, PISM can apply an optional bed deformation component approximating the movement of the Earth’s crust and upper mantle in response to changing ice load. In these senses everything below the black dashed line in Fig. 15 is always “owned” by PISM. The PISM ice dynamics core would like to get the required fields listed in Table 5 directly from observations or measurements, or directly from a GCM. 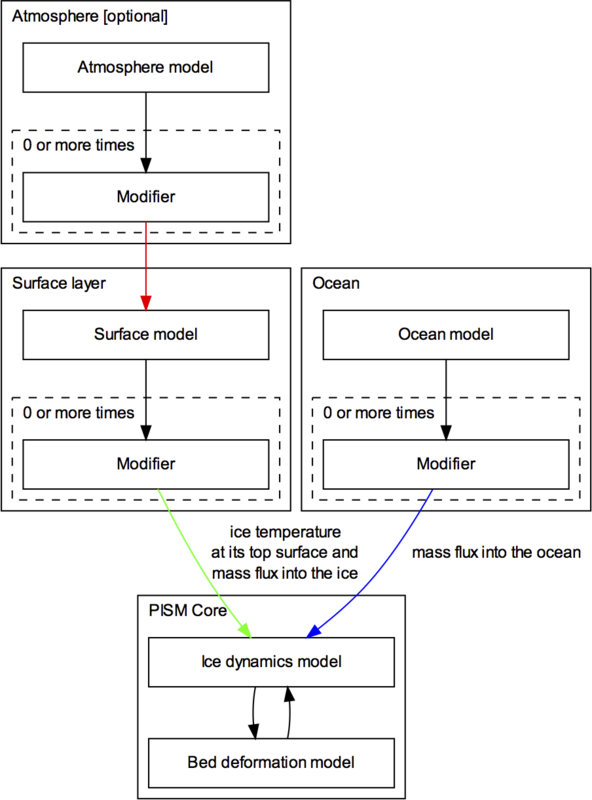 In many realistic modeling situations, however, PISM code must be used for all or part of the surface processes modeling necessary to provide the ice-dynamics core with the needed fields. Due to differences in model resolutions and required down-scaling, this need for some PISM-based boundary-processes modelling may occur even in some cases where PISM is coupled to a GCM. Thus, to be able to use the data that is available, a PISM run might use components that are responsible for modeling surface (snow) processes or sub-shelf/ocean interaction. These components might be very minimal, merely turning data that we already have into data in the right units and with the right metadata. Fig. 16 PISM climate input data flow. Colored arrows correspond to interfaces in Fig. 15. Thus we have PISM’s design: the ice-dynamics PISM core does not contain any parameterization or other model for boundary mass or energy fluxes into or out of the ice. These boundary parameterizations and models are present in the PISM source code, however, as instances of pism::Component classes. This simplifies customizing and debugging PISM’s climate inputs, and it promotes code reuse. It isolates the code that needs to be changed to couple PISM to different climate models. The classes pism::SurfaceModel, pism::AtmosphereModel, and pism::OceanModel are all derived from pism::Component. Corresponding to the red dashed line in Fig. 15, a pism::AtmosphereModel might not even be present in some PISM configurations. While they are required, pism::SurfaceModel and pism::OceanModel may contain (hide) anything from nearly-trivial parameterizations of ice surface temperatures and mass fluxes to a GCM of great complexity. The “modifiers” in Fig. 16 adjust the climate model inputs. Modifiers can be chained together so that multiple modifications are made to the outputs of the original component. For example, ice-core-derived air temperature offsets, used to model the space-time distribution of paleo-climatic surface temperature, is an example of an implemented modifier. Please see the Climate Forcing Manual for a list of climate components and modifiers included in PISM source code and other details. Users wishing to customize PISM’s climate inputs and/or couple PISM to a climate model should additionally see the PISM Source Browser and the documentation therein. Fig. 16 illustrates the data flow needed by the ice dynamics core. The data flow in the other direction, i.e. needed by the model to which PISM is coupled, depends on particular modeling choices, but great flexibility is allowed. Why describe all this structure here? On the one hand, some users may be interested in coupling PISM to other models. On the other hand, the PISM authors do not claim expertise in modeling atmosphere, ocean, or even snow processes. This separation has a definite code-reliability purpose. PISM users are ultimately responsible for providing the climate inputs they intend.